Div. Three on Friday, in an unpublished opinion by Justice Raymond J. Ikola, spurned erstwhile candidate Lenore L. Albert’s appeal of orders by Orange Superior Court Judge Craig L. Griffin, finding no justification for addressing the merits notwithstanding mootness. 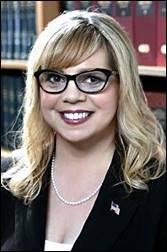 Albert had been suspended from law practice by the California Supreme Court in December 2017 for a minimum of 30 days, with suspension to continue indefinitely until she paid sanctions in a civil rights case—which she had not done as of the time Orange County voter Mark Daniels brought a writ petition on March 19, 2018, to block her candidacy. Daniels also challenged her ballot designation. Albert protested that the ruling was “based on a pattern and practice of depriving candidates in Orange County” of their rights of free speech and equal protection. In a four-person primary, Albert came in fourth, garnering 3.8 percent of the vote. The case is Daniels v. Kelley, G056153. Albert—who remains under State Bar suspension and currently faces additional disciplinary charges—represented herself. Acting for the petitioner was Brea attorney Gregory Diamond. Diamond’s client, Daniels, is a Democratic activist who was backing a candidate in the 2018 primary, Brett Murdock, who came in third. Incumbent Tony Rackauckas was forced into a run-off with then-Supervisor Todd Spitzer, who prevailed in the Nov. 6 general election. On March 6, 2018, Albert lost, for the most part, three appeals of anti-SLAPP motions granted to persons she sued, while in a fourth case, she gained a partial reversal. Acting Presiding Justice William W. Bedsworth of Div. Three wrote the opinions. Albert was the Democratic Party’s unsuccessful candidate for the Assembly in 2016.